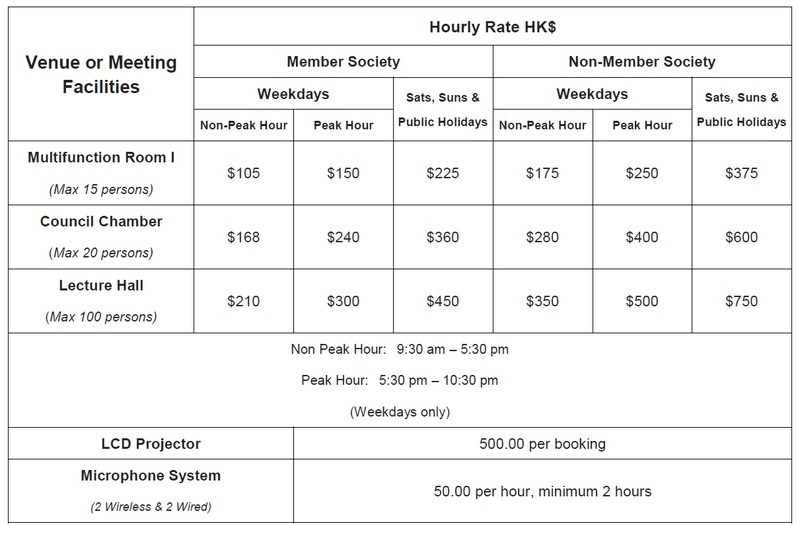 Hirer will be liable to pay an extra hour of room charge if the booked session is not completed within 15 minutes at the end of the rental period. There will be a surcharge of 20% of the total food and drink cost if such is served in the meeting facilities. An extra deposit of HK$1,500 is required when booking the facilities and will be returned if cleaning or repair is not required after the rental. When typhoon signal no. 8 or black rainstorm warning signal is hoisted, all meeting facilities will be closed and the rental charges will be refunded. The facilities will reopen two hours after typhoon signal no. 8 or the black rainstorm warning signal is lowered. For enquiry and booking, please contact the Secretariat at 2527 8898. 2527 8898 during office hours.